Now this is a true Texas Beef Chili. No, I’m not from Texas nor am I a chili connoisseur (that’s a thing, right? )… BUT this recipe is from my sweet friend Jennifer, who’s a true southern gal and knows her stuff. 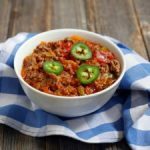 This flavorful and comforting Texas Slow Cooker Beef Chili is from her new cookbook, Down South Paleo. I have to tell you how much Roby and I loved this meaty meal! 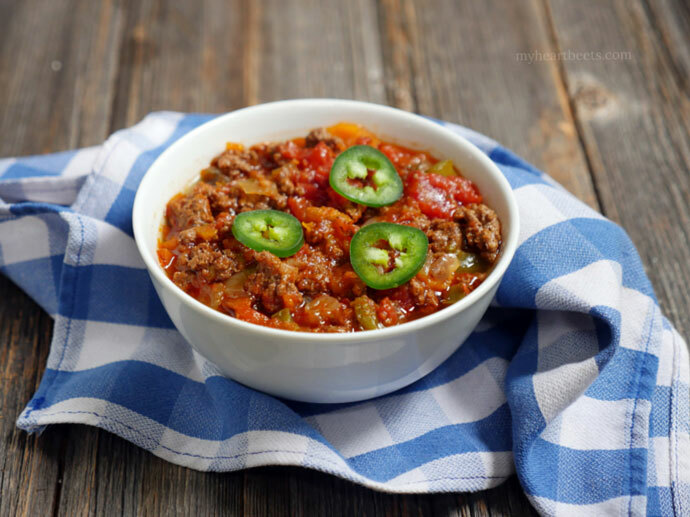 It’s a hearty chili that’s packed with ground beef, fresh vegetables and savory spices. It’s definitely a family-friendly dish. Don’t worry, the chili isn’t spicy – unless you add the jalapeños (which were a must for my spicy food loving husband). 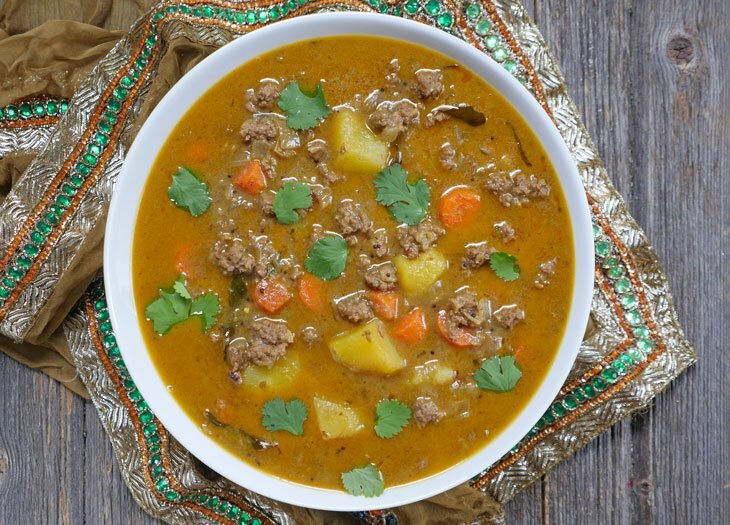 You can make this recipe in a slow cooker, but if you’re impatient like me and own an Instant Pot (an electronic pressure cooker), then by all means use that! I’ll include directions for both methods below. Also, if you’re wondering where to find gluten-free worcestershire sauce, you can try this brand. Make sure that it says “gluten-free” on the back. You should be able to find it in most grocery stores – I found it at Whole Foods. Okay, now back to this lovely book! The recipes are so creative and unique. And the book’s concept? Oh my heavens, brilliant! Who doesn’t love soul food, Tex-Mex and Cajun cooking?! 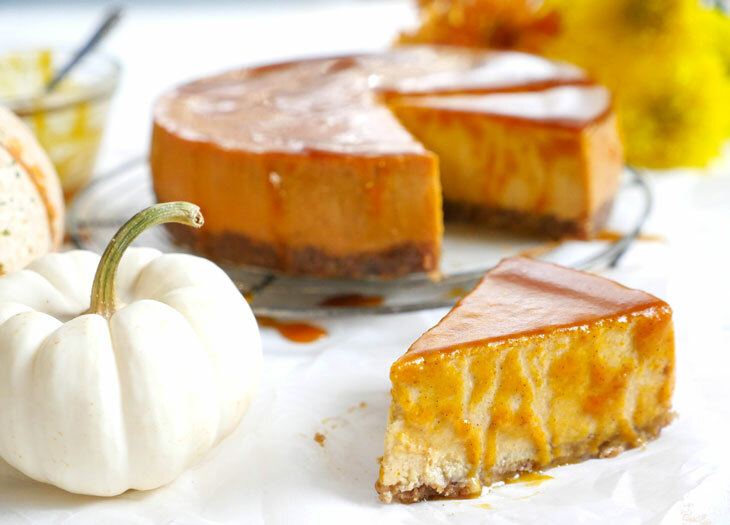 With recipes like pecan waffles, fried chicken, blueberry brisket, stuffed poblano peppers, churro doughnut holes, and tres leches cake – there’s no doubt that Down South Paleo will become a favorite in your kitchen! Place the ground beef in a medium-size skillet over high heat and brown, stirring, until no longer pink. Spoon it into your slow cooker, including the fat. Now place the green bell pepper, onion, carrots and tomatoes into the slow cooker. Stir all the ingredients well, then add the remaining spices and seasonings. Stir once more, cover and cook on low for 8 hours or on high for 5 hours. Top with dairy-free sour cream if desired, additional diced onions or jalapeños. Press the “Sauté” button on the Instant Pot, and add the ground beef to the pot and cook until brown. Add the remaining ingredients, mix well, then cover and lock the lid. Press the “Keep Warm/Cancel” button on the Instant Pot, then press the “Meat/Stew” button to begin the pressure cooking. It will automatically be set for 35 minutes. Make sure the steam valve is closed. Once the chili is done, the Instant Pot will automatically switch to the “Keep Warm” mode. Allow the pressure to release naturally or use the quick release. As soon as I saw this in an email from MyHeartBeets yesterday morning, I knew I wanted to try it (especially because I’m trying to use my Crock Pot more). It. Was. Awesome. My roommates and I wolfed it down with a side of cole slaw, and there was barely any left for leftovers. I didn’t have worcestershire sauce (although I’m sure that would have tasted amazing), so I added a couple of other spices, and it was still incredible. Thanks for giving me something new to try, that was SUPER easy to do! Thanks for the Instant Pot directions. I’m still getting used to it, so was looking for something good to try. This was delicious. Worcestershire sauce is not Whole30 compliant since it contains both sugar and molasses, but I found a recipe here. I was too impatient to make this, but added a little of all the ingredients in with the chili. Seemed to work fine. This was so delicious in my Instant Pot, thank you. I cobbled together my own version of a paleo type Worcestershire with honey and lemon juice, and it seemed to do the trick. I’m about to make this dish again, only a double batch this time! I’m doing an MSG free diet, which is even a bit more restrictive than Paleo, and your website has so many great recipes, I really appreciate what you do. I have made 5 different things found here so far and they are all amazing! if i wanted to double up the amount of meat, would i also double up all the other ingredients? thanks! if i was going to used canned diced tomatoes instead of chopping them up, what would you recommend in terms of ounces? I used a 26 oz box of crushed tomatoes and added a little fancy tomato paste. Curious, what’s “a little” for the tomato paste? Hi. Looking forward to getting an Instant Pot. Just curious. What happens if you don’t press the Keep Warm/Cancel button first? How much does this recipe yield? Thanks! I’d say it serves 4. hope that helps! Hi there! This looks like a good chili recipe, Thanks for posting it! I’m going to give it a shot in my IP. I just wondered if adding beans would be ok? You think I can add a can of beans, drained as well? Thank you! Soni, I’m sure beans will be great in this 🙂 Enjoy! I tried making this tonight, and I feel like I followed the directions exactly, but it came out more like a soup than a chili. Do you have any idea what I could have possibly done wrong? This was my first time using the instant pot. Hi Miguel! When you pressure cook, meat sometimes releases a lot of water. Once the food is done, just hit the saute button to boil off and reduce any excess water/liquid. Weird, I followed it to a T and it was nice and thick. I used ground beef that was 90% fat free and I added a little tomato paste. I sauted some sugar free bacon in the bottom of the pan before anything just to add a little extra smoky flavor! Excellent recipe! Pairs well with a little paleo “cornbread”! Ooh love that you added bacon, yum!! 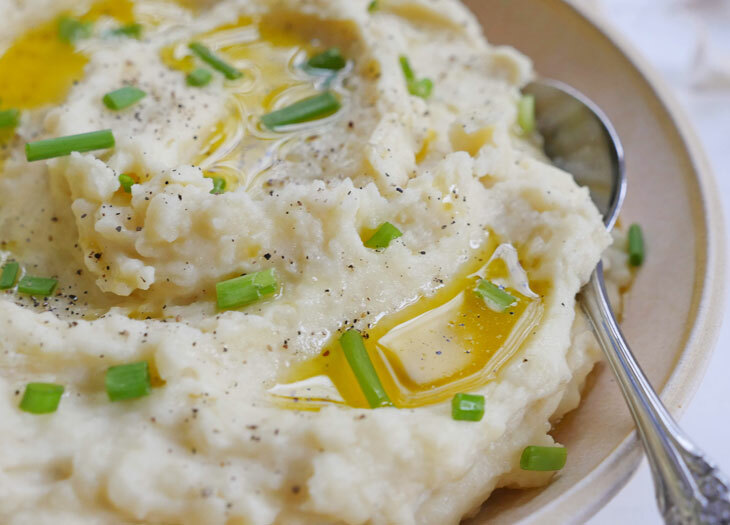 I made this tonight in my Instant Pot for a pot luck and it was a hit, everyone raved about it and it was the first thing gone. My kids even asked me to make it again tomorrow to serve over baked potatoes! They don’t like peppers and onions so I diced them really small in my Cuisinart and they melted right in so they didn’t have to pick them out. The carrots are a nice touch. I added a little fancy tomato paste. It came out perfect! Shannon, I’m so happy to hear that! Love the idea of serving it over baked potatoes, I’ll have to try that! Hi Michelle, nope – the meat releases liquid in the pressure cooker but you can always add broth to the pot then just press “saute” once it’s done to reduce the liquid if it ends up being too thin. Any details on nutritional info? I can use my fitness pal but I’m feeling super lazy and don’t feel like it. Currently sautéing the excess liquid to thicken the chili. The flavor is fantastic! I don’t see any ingredients listed? I’m so sorry, my recipes are only showing up on desktop/laptop and not on mobile devices at the moment – I’m in the middle of a website update so this should be resolved asap! Just won 2nd place in a local chili cook off with this recipe. I also added bacon and honey to the IP during sauté. Oh my gosh!! Sooo delicious! Wouldn’t change a thing! Yum yum yum! I’m trying the IP for the first time with a slightly different recipe that calls for 3 pounds of meat and a quart of beef stock. 1. Can the IP handle that much? And, 2. Is a quart of fluid too much? First time using my IP and this chili was a success! I substituted a small can of tomato paste and a small can of tomato sauce for the tomatoes (can’t eat the seeds) but used all of the other ingredients, modifying them slightly for my taste. I think my chili needed about 1/4 cup water added to it as it was a bit thick. 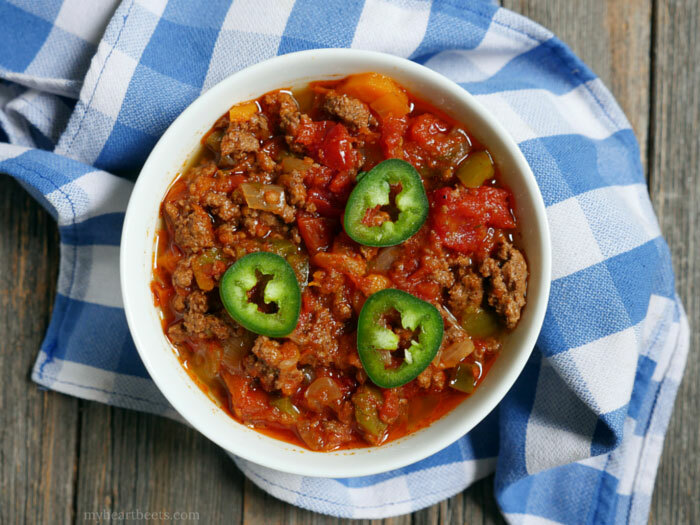 This is the best Texas chili recipe I’ve found and will absolutely make it again. Thanks! Deb, that’s so great to hear! Thanks for sharing the tomato sub! It’s still cooking, but seemed very light in chili powder. Other family approved Texas Chili recipe I’ve been using uses Tablespoons of chili powder, not teaspoons. It’s missing something after tasting it, so will be adding more. I followed recipe exactly but when I opened the pot, the chili was dry and burnt on the bottom. I will make it again because the flavor is good, but will add liquid. Delish! I added 1-2 TBS of tomato paste as well, just to thicken it up. 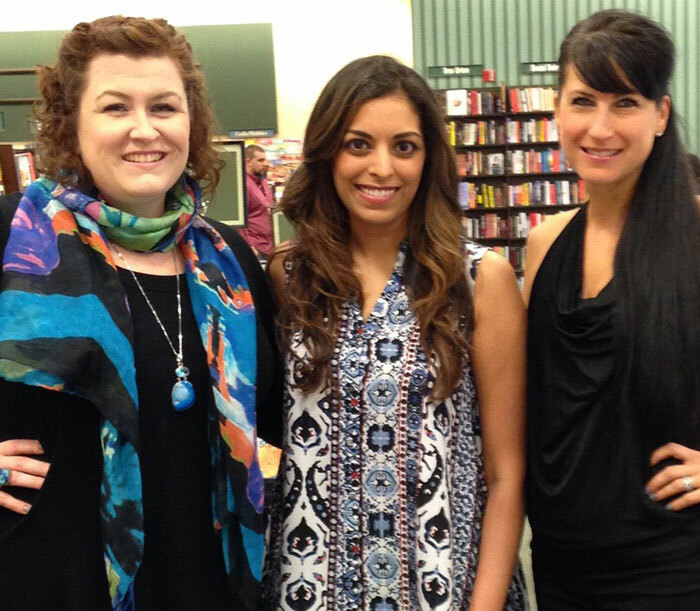 Laura, glad you liked it! My son doesn’t like chunks of tomotoes, do you think I could use tomato sauce? If so how much? I love this! I made it last night for today’s “SOUPer” bowl at work, where we teachers all bring in our crockpots full of the dishes we made. I’ve made chili a lot, so many different versions, but I really wanted to find a good no-bean version. After reading all of everyone’s comments, I did saute some bacon first in my nonstick crockpot. Removed the bacon and chopped it up. Sauteed my meat in the bacon grease, along with some honey! I doubled the recipe, so I used 1 lb of lean ground beef and 1 lb of ground mild sausage. I had some fresh jalapeno peppers, so I chopped two of those and added them in. Gives it a little extra heat, which I like! I also added the chopped up bacon back into the mix. p.s. I hope I win!!!! Nancy, I’m so happy to hear that!! I hope you won the contest! !